Name Variation John Fletcher Pershing was also known as Fletcher. Name Variation John Fletcher Pershing was also known as Jonathan M.
John Fletcher Pershing was born on 1 March 1834 at Bradenville, Westmoreland, Pennsylvania. He was the son of Joseph Mercer Pershing and Elizabeth Davis. John Fletcher Pershing married Ann Elizabeth Thompson on 22 March 1859. John Fletcher Pershing died on 16 March 1906 at home of his daughter, Mrs. D. M. Butler, Lincoln, Nebraska, at age 72 John F Pershing obituary; also reported as 15 Mar 1908 in Chicago, Illinois. He was buried after 15 March 1908 at Oakwood Cemetery, Chicago, Cook, Illinois. Circa 1864 at Civil War Draft Registrations, Laclede, Linn, Missouri, handwritten note on the register: "Stricken from the list by order of Board of Enlistment Aug 25, 1864 because of having furnished a three year substitute mustered in by the Pro Mar." John Fletcher Pershing was a Dry Goods Merchant in 1870. [S248] U.S. Federal Census 1860 U.S. Federal Census, by Ancestry.com, Year: 1860; Census Place: Township 58 Range 22, Linn, Missouri; Roll: M653_630; Page: 731; Family History Library Film: 803630. [S247] U.S. Federal Census 1870 U.S. Federal Census, by Ancestry.com, Year: 1870; Census Place: Jefferson, Linn, Missouri; Roll: M593_788; Page: 311A; Family History Library Film: 552287. [S246] U.S. Federal Census 1880 U.S. Federal Census, by Ancestry.com, Year: 1880; Census Place: Laclede, Linn, Missouri; Roll: 700; Family History Film: 1254700; Page: 478C; Enumeration District: 184. [S245] U.S. Federal Census 1900 U.S. Federal Census, by Ancestry.com, Year: 1900; Census Place: Chicago Ward 32, Cook, Illinois; Roll: 287; Page: 4B; Enumeration District: 1037; FHL microfilm: 1240287. Married Name 22 March 1859 As of 22 March 1859,her married name was Pershing. Ann Elizabeth Thompson was born on 15 February 1835 at Tennessee. She married John Fletcher Pershing, son of Joseph Mercer Pershing and Elizabeth Davis, on 22 March 1859. Ann Elizabeth Thompson died on 24 November 1902 at Chicago, Cook, Illinois, at age 67. She was buried after 24 November 1902 at Oakwood Cemetery, Chicago, Cook, Illinois. Ann Elizabeth Thompson had 9 with 6 living in 1900 children. Nickname General John Joseph Pershing also went by the name of Black Jack. General John Joseph Pershing was born on 13 September 1860 at Laclede, Linn, Missouri. He was the son of John Fletcher Pershing and Ann Elizabeth Thompson. General John Joseph Pershing married Helen Frances Warren, daughter of Senator Francis E. Warren of Wyoming, on 26 January 1905 at 1st marriage for both, Washington, District of Columbia. General John Joseph Pershing witnessed the burial of Captain Ward Beecher Pershing on 1 September 1909 at Oakwood Cemetery, Chicago, Cook, Illinois. General John Joseph Pershing died on 15 July 1948 at Walter Reed Hospital, Washington, District of Columbia, at age 87. He was buried after 15 July 1948 at Washington National Cemetery, Washington, District of Columbia. On 27 August 1915 his wife Helen and three daughters burned to death in a fire at the Presidio military reservation in San Francisco. He was in the field commanding a Mexican border patrol. Only his 6-year-old son F. Warren Pershing escaped alive. 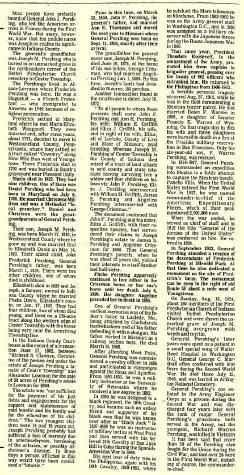 In April 1987 Family History of General John Joseph Pershing. [S244] U.S. Federal Census 1910 U.S. Federal Census, by Ancestry.com, Year: 1910; Census Place: Cheyenne Ward 2, Laramie, Wyoming; Roll: T624_1746; Page: 9A; Enumeration District: 0079; FHL microfilm: 1375759. Name Variation Anna May Pershing was also known as May. Anna May Pershing was born on 30 June 1867 at Laclede, Linn, Missouri, also reported as June 1869. She was the daughter of John Fletcher Pershing and Ann Elizabeth Thompson. Anna May Pershing witnessed the burial of Captain Ward Beecher Pershing on 1 September 1909 at Oakwood Cemetery, Chicago, Cook, Illinois. As of 1920, Anna May Pershing was never married. 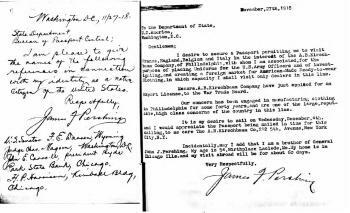 On 6 August 1904 at U S Passport application, Chicago, Cook, Illinois. [S243] U.S. Federal Census 1920 U.S. Federal Census, by Ancestry.com, Year: 1920; Census Place: Lincoln Ward 5, Lancaster, Nebraska; Roll: T625_996; Page: 4B; Enumeration District: 70. Captain Ward Beecher Pershing was born on 31 March 1874 at Laclede, Linn, Missouri. Captain Ward Beecher Pershing married Gertrude E. Haines on 16 June 1908 at Boulder, Boulder, Colorado. Captain Ward Beecher Pershing died on 28 August 1909 at Denver, Colorado, at age 35 Ward B Pershing obituary. He was buried on 1 September 1909 at Oakwood Cemetery, Chicago, Cook, Illinois. Married Name 16 June 1908 As of 16 June 1908,her married name was Pershing. Gertrude E. Haines was born circa 1879. She married Captain Ward Beecher Pershing, son of John Fletcher Pershing and Ann Elizabeth Thompson, on 16 June 1908 at Boulder, Boulder, Colorado. Married Name before 1903 As of before 1903,her married name was Hallock. Grace Pershing was born circa 1869 at Missouri. Grace Pershing married Lieutenant (?) Hallock before 1903. Grace Pershing died before 1906. James F. Pershing was born on 18 January 1864 at Laclede, Linn, Missouri. James F. Pershing married Jessie E. Jackson on 12 March 1884 at Chicago, Cook, Illinois. James F. Pershing died on 9 February 1933 at hospital, New York, New York, at age 69 James F Pershing obituary. 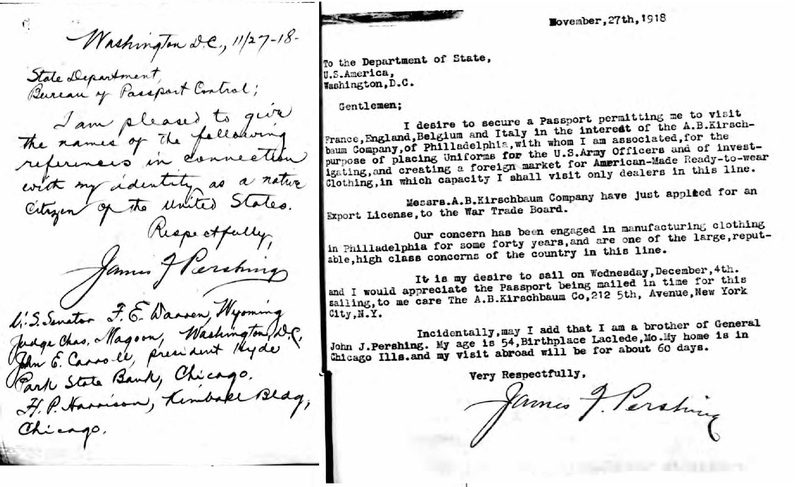 On 4 December 1918 at U S Passport application, Chicago, Cook, Illinois, with supporting letters. 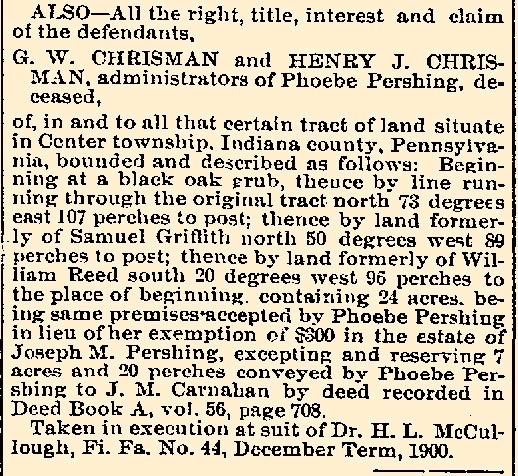 In 1934 description of Pershing land in Linn county, Missouri. Married Name 12 March 1884 As of 12 March 1884,her married name was Pershing. Jessie E. Jackson was born circa 1866. She married James F. Pershing, son of John Fletcher Pershing and Ann Elizabeth Thompson, on 12 March 1884 at Chicago, Cook, Illinois. 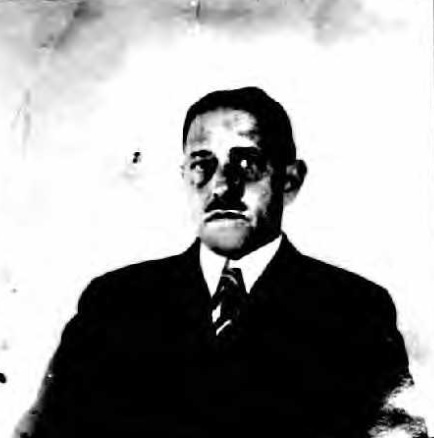 Jessie E. Jackson died after 1933. Nickname Helen Frances Warren also went by the name of Frankie. Married Name 26 January 1905 As of 26 January 1905,her married name was Pershing. Helen Frances Warren was born on 16 August 1880 at Wyoming. She was the daughter of Senator Francis E. Warren of Wyoming. Helen Frances Warren married General John Joseph Pershing, son of John Fletcher Pershing and Ann Elizabeth Thompson, on 26 January 1905 at 1st marriage for both, Washington, District of Columbia. Helen Frances Warren died on 27 August 1915 at San Francisco, California, at age 35 Helen and three daughters burned to death in a fire at the Presidio military reservation in San Francisco. Only 6-year-old son F. Warren Pershing was rescued. Her husband was in the field commanding a Mexican border patrol. She was buried after 27 August 1915 at Lakeview Cemetery, Cheyenne, Laramie, Wyoming. Helen Frances Warren had 3 with 3 living in 1910 children. Helen Elizabeth Pershing was born on 8 September 1906 at Japan. She was the daughter of General John Joseph Pershing and Helen Frances Warren. Helen Elizabeth Pershing died on 27 August 1915 at age 8 when her mother and two sisters burned to death in a fire at the Presidio military reservation in San Francisco. Anne Pershing was born on 25 March 1908 at Philippines. Anne Pershing died on 27 August 1915 at age 7 when her mother and two sisters burned to death in a fire at the Presidio military reservation in San Francisco. Name Variation Frances Warren Pershing was also known as F. Warren. Name Variation Frances Warren Pershing was also known as Warren. Name Variation Frances Warren Pershing was also known as Francis Warren. Frances Warren Pershing was born on 24 June 1909 at Cheyenne, Wyoming. He was the son of General John Joseph Pershing and Helen Frances Warren. 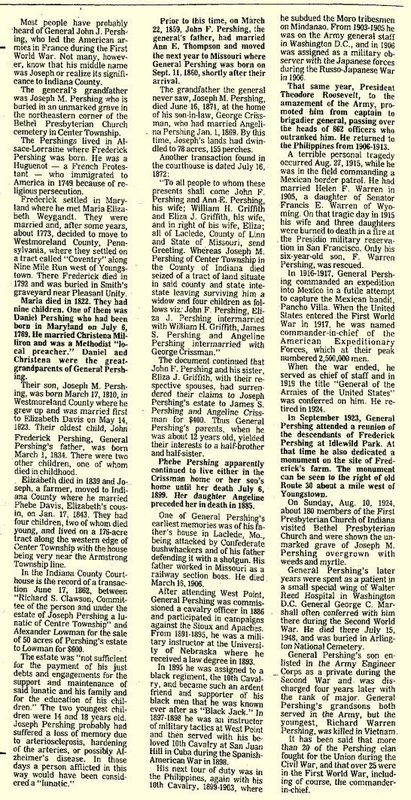 Frances Warren Pershing died in June 1980. On 27 August 1915 his mother Helen and three sisters burned to death in a fire at the Presidio military reservation in San Francisco. Only he was rescued. His father was in the field commanding a Mexican border patrol at the time. Warren later moved in with his aunts. On 3 September 1924 at U S Passport Application, District of Columbia. Name Variation Mary E. Pershing was also known as Bessie. Married Name 1880 As of 1880,her married name was Butler. Mary E. Pershing was born circa 1865 at Missouri. Mary E. Pershing married D. M. Butler in 1880. 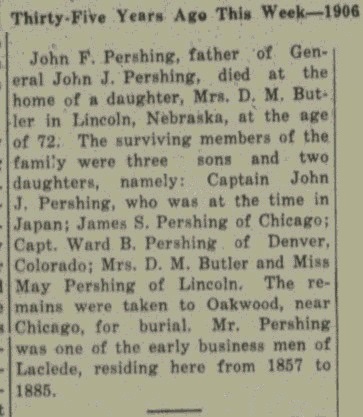 Mary E. Pershing witnessed the death of John Fletcher Pershing on 16 March 1906 at home of his daughter, Mrs. D. M. Butler, Lincoln, Nebraska; John F Pershing obituary; also reported as 15 Mar 1908 in Chicago, Illinois. Mary E. Pershing witnessed the burial of Captain Ward Beecher Pershing on 1 September 1909 at Oakwood Cemetery, Chicago, Cook, Illinois. 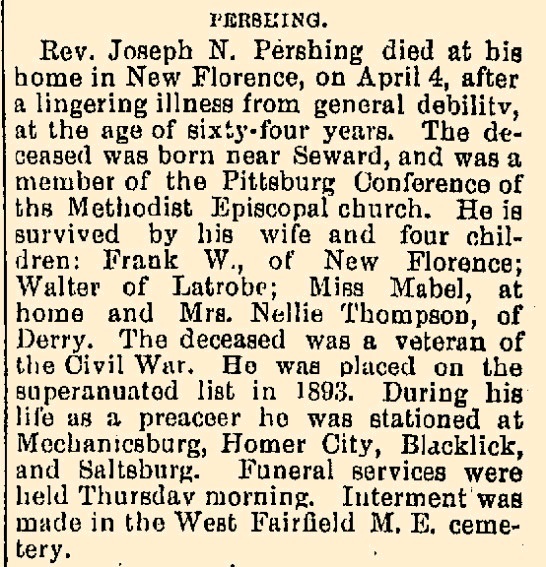 Mary E. Pershing died in December 1928 at home, Lincoln, Nebraska, Mrs Bessie (Pershing) Bulter obituary. Mary E. Pershing and D. M. Butler lived in 1903 at Lincoln, Nebraska. D. M. Butler married Mary E. Pershing, daughter of John Fletcher Pershing and Ann Elizabeth Thompson, in 1880. D. M. Butler died before 1920. D. M. Butler and Mary E. Pershing lived in 1903 at Lincoln, Nebraska. Name Variation Phebe Davis was also known as Phoebe. Married Name 17 January 1843 As of 17 January 1843,her married name was Pershing. Phebe Davis married Joseph Mercer Pershing, son of Reverand Daniel Pershing and Maria Christena Milliron, on 17 January 1843 at Indiana, Pennsylvania, she was a cousin of his first wife Elizabeth. Phebe Davis died on 6 July 1899. 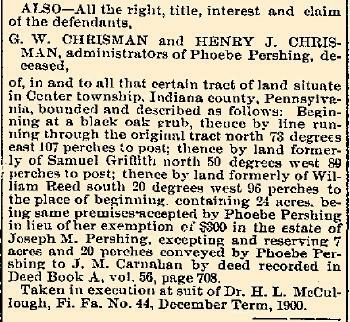 In November 1900 at Indiana, Pennsylvania, legal document published of Phoebe (Davis) Pershing, deceased. Married Name 1 January 1869 As of 1 January 1869,her married name was Chrissman. She was the daughter of Joseph Mercer Pershing and Phebe Davis. Angelina Pershing married George Chrissman on 1 January 1869. Angelina Pershing died in 1885. George Chrissman married Angelina Pershing, daughter of Joseph Mercer Pershing and Phebe Davis, on 1 January 1869. Eliza J. Pershing married William H. Griffith. Eliza J. Pershing was born. She was the daughter of Joseph Mercer Pershing and Elizabeth Davis. William H. Griffith married Eliza J. Pershing, daughter of Joseph Mercer Pershing and Elizabeth Davis. James S. Pershing was born. He was the son of Joseph Mercer Pershing and Phebe Davis. Mary Margaret Pershing was born on 19 May 1912 at Philippines. Mary Margaret Pershing died on 27 August 1915 at age 3 when her mother and two sisters burned to death in a fire at the Presidio military reservation in San Francisco. Peter Frederick Pershing was born in 1759 at York, Pennsylvania. 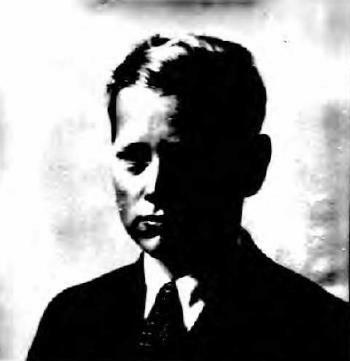 He was the son of Frederick Pfoersching and Maria Elizabeth Weygandt. Peter Frederick Pershing married Elizabeth Ulery in 1791. Married Name 1791 As of 1791,her married name was Pershing. Elizabeth Ulery married Peter Frederick Pershing, son of Frederick Pfoersching and Maria Elizabeth Weygandt, in 1791. Daniel Pershing married Elizabeth Hice. Daniel Pershing was born on 2 December 1805 at Pennsylvania. He was the son of Peter Frederick Pershing and Elizabeth Ulery. Daniel Pershing died on 16 October 1888 at Indiana, Pennsylvania, at age 82. Married Name Her married name was Pershing. Elizabeth Hice married Daniel Pershing, son of Peter Frederick Pershing and Elizabeth Ulery. Elizabeth Hice was born on 1 October 1804 at Pennsylvania. She died on 24 January 1849 at Indiana, Pennsylvania, at age 44. Reverand Joseph N. Pershing was born on 20 March 1841 at Indiana, Pennsylvania. 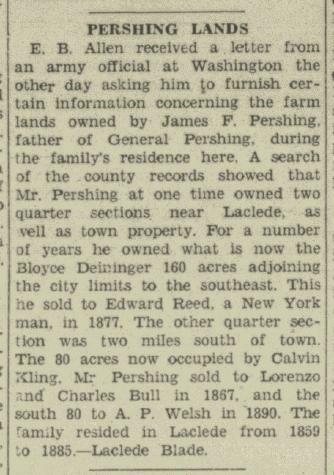 He was the son of Daniel Pershing and Elizabeth Hice. 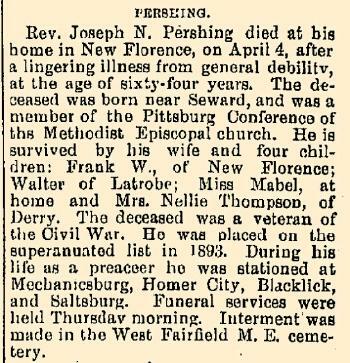 Reverand Joseph N. Pershing died on 4 April 1905 at New Florence, Westmoreland, Pennsylvania, at age 64 Rev Joseph N Pershing obituary. Lieutenant (?) Hallock died before 1903 at China. He married Grace Pershing, daughter of John Fletcher Pershing and Ann Elizabeth Thompson, before 1903. James F. Pershing Jr. was the son of James F. Pershing and Jessie E. Jackson.